Restorative practices enable all members of the school community to integrate and normalize a collaborative approach by focusing on building, maintaining and when necessary, repairing relationships among all members of a school. When students feel like they have an increased connection to school, they will have more educational motivation, classroom engagement and improved school attendance. Learn about principles in problem solving, communication amongst students, staff and community to establish a positive school culture. Download accompanying handouts here and here. 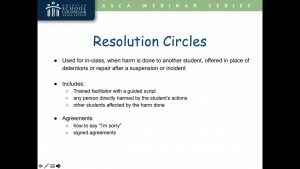 Explain restorative practices and how they will affect your school. Access a toolbox of materials and ideas to utilize in your school. Implement community and problem-solving circles in your program.